Prom is coming up quickly for LHS juniors and seniors and the invitations have been handed out. Prepping and figuring out every aspect is huge for all high school students when it comes to prom time. Here are some ideas on what you can do to look perfect on this big day. Hair is a big part of the whole day. Everyone figures out what they want to do with their hair sometimes months before the actual prom. If your dress is super fancy and has a lot going on, a simpler more casual hairstyle is always good. When it comes to doing more simple styles, you don’t need to go out and spend the money on a hair stylist. That’s when you can ask a friend or even do it yourself. If the dress is more simple then it’s always fun to do a crazy updo, and you can get professionals involved. At home facials can be very helpful in reducing stress and just taking a break while also making yourself feel and look best for prom! Just doing a small skincare routine, like a face mask or just giving your skin some detox will make a huge difference for this huge day. Nails are a much smaller but very important part of anyone’s prom look. It’s a perfect excuse to go out and get your nails done and to match the color to your dress. It’s also a perfect way to de-stress and just relax because school is still going on and even just prepping for prom can be stressful. 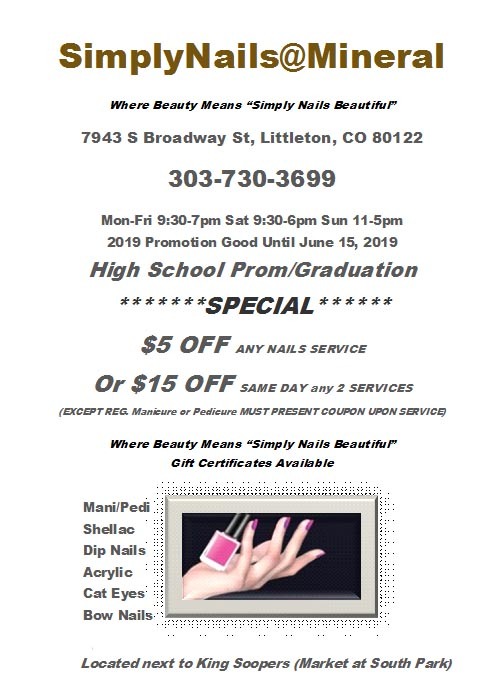 See the ad with this story for a place close to LHS that will give you a discount for prom (or graduation!). Prom is a big deal and looking and feeling your best always makes it so much better. Remember, take care of yourself and make this experience and fun and stress free as it can be. Even just the little things can make a big difference so put some thought into those as well.